The increasing use of technology in the classroom is often driven by innovative and motivated teachers who look for new ways to engage and challenge their students. Often these innovators work without the support of their administrators, who may be slow to embrace new technologies and workflows. But there are exceptions. 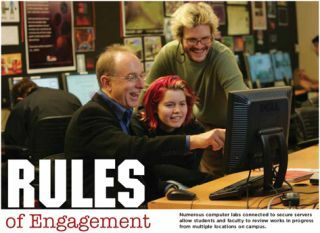 At the University of Southern California, the administration is not only supportive but also proactive - it turned the use of technology into a campus-wide initiative that provides both equipment and instructions on how to use it, and encourages faculty to integrate current collaborative technologies into their curricula. Incoming students enter the university with higher expectations and greater familiarity with technology than did their predecessors. Even at the secondary school level, they have used social networks like Facebook, peer-to peer file sharing software like BitTorrent, and advanced applications like Photoshop. This, along with increasing demand for graduate-level courses for working adults, has driven universities like USC to implement technology to stay at the forefront of teaching and learning. Recognizing this need, in September of 2005 USC Provost C.L. Max Nikias announced an initiative to create a new organization within the Information Technology Services department that would provide decentralized information services to every school within USC. Within six months, that initiative spawned a new organization known as USC's Technology Enhanced Learning and Distance Learning group (abbreviated TEL or TEL_DL), as well as an overall pedagogical objective for all university faculty and students. The group was mandated to get pre-configured kits containing the latest technology into the hands of as many faculty as were interested, and to help them get the most from these tools. TEL_DL makes available various hardware and software kits for faculty evaluation and use. In addition to more widely implemented tools like the Blackboard Course Management System, TEL also provides personal response clickers, podcasting kits with a microphone and an Edirol handheld recorder plus software, hosting space on USC's page on iTunes U, and even complete mobile briefcases that contain a laptop, headphones and small speakers, a wireless microphone, and a USB camera. Each of these packages comes with complete documentation written by TEL_DL members, explaining how to use the equipment and upload or post the results. Each school within the university is assigned two TEL Ambassadors from the group, who are available for faculty consultation and individual instruction where necessary. Live group training sessions are held periodically for interested faculty. In the summer of 2006, the TEL group specified 16 new studio classrooms throughout both USC campuses and Childrens Hospital Los Angeles, bringing the total number to over 20. During the specification process it became obvious to TEL and to the administration that a cookie-cutter approach to outfitting each of these rooms was impractical. Instead, the committee looked carefully at physical layouts and how each room would be used, and customized the installation to best suit the needs of the rooms' users. Converting classrooms that had existing AV equipment averaged over $200,000 per room, while converting bare classrooms was substantially more. Although this custom approach complicated the design process and increased costs, both TEL and the administration felt the results justified the investment. The basic studio classroom includes an AMX control panel built into the lectern, allowing control of media projected on retractable screens, as well as control of lighting and audio volume. Media can be sourced from a builtin PC, a document camera, a Wacom tablet with Starboard software for drawing, and a combination DVD/VCR player. Individual studio classrooms may also be equipped with two or three projector/screen combinations, along with multiple pan/tilt/zoom cameras for video teleconferencing. Audio and video recording is served by DV and mini-DV recorders, and most rooms feature gigabit Ethernet connectivity. One room is also wired for Internet2. Each room also has a dedicated control room, where IT staff can assist with recording lectures or video teleconferencing. At USC's Thornton School of Music, Dr. Brian Shepard is an assistant professor of pedagogical technology who has been steeped in classroom technology for over a decade. In the fall of 1999, while a professor at the University of Oklahoma, Shepard pioneered the use of Internet2 to conduct private music lessons, master classes, and performances at a distance. He joined USC just as the TEL initiative was being rolled out, including a mandate that USC implement his specialty, Internet2. As his current title indicates, Shepard is today intimately involved in USC's TEL_DL project. "I find myself having to explain my title. It's kind of cool, and serves as an entrée when they ask, 'What does that mean?' But the term pedagogical technology is rarely used here anymore. Technology is so tightly integrated into teaching that it's just considered part of the gig." However, it is "part of the gig" that is still foreign to a segment of the faculty, who may perceive technology tools as difficult to learn or integrate into their curricula. Shepard notes, "Faculty say to me, 'I've heard about these technology tools, but I don't know what they are and I don't have time to learn about them.' The TEL_DL community is there to help faculty find and use this stuff." Part of his job is to ensure that Thornton faculty are comfortable using clickers, podcasts, and content management systems, but do so without losing the personal touch that only comes from face-to-face teaching. "The web has made our environment technically and culturally rich, but most of us as faculty didn't grow up in the same kind of rich environment. The TEL_DL solutions help bridge that gap between faculty and students. Hopefully they help us understand where the students are coming from, and help us find a common place to meet each other." The fact that students today are facile with online tools is no reason for faculty to be intimidated by the students or the technology. Shepard remarks, "We watch our students and we say, 'Wow, these young people are really good at technology!' What they're good at is pushing buttons and using joysticks, but their reasoning skills aren't fully developed. They still don't understand the logic and thought process behind pushing that button. So the TEL community says to faculty, 'Don't be afraid of this stuff - you know more than they do. We still have the maturity and wisdom of experience. If we can couple that with technology, we'll have a common meeting ground. I think that's been the real purpose of the TEL community, to get the word out to faculty." In addition to providing technology services to on-campus classes, TEL_DL's services support USC's two categories of distance learning programs - online Degree Programs and online Continuing Education. The two differ in that Continuing Education programs are generally certificate programs designed for working professionals in dentistry, medicine, education, engineering, and business, and CE students need not be formally admitted into the University. Degree Programs require formal admission, and offer graduate-level degrees and certificates in geography, medicine, gerontology, and engineering. Founded in 1972, the Viterbi School of Engineering's Distance Education Network offers the largest variety of programs, and its current enrollment tops 1,300 students. The Thornton School does not yet offer online degrees or certificates, although several programs are in the works. Dr. Shepard admits that the science and engineering schools have a head start on distance learning. "So much of the emphasis on distance learning comes from the hard sciences, and yet there's so much potential for it within arts and humanities. In some ways, what we at Thornton do is more demanding on the technology [than science and engineering]. Some of those folks are happy with an H.323 videoconference, but our applications require superior audio and video. It's why we're so late getting in to it - the knowledge and facilities to do what we need to do is not as widely available here." Dr. Shepard even finds the term distance learning inadequate. "I prefer 'a classroom without walls,' since that implies a very narrow segment of 'me here - student there.' Classroom without walls is a better term because sometimes students are here, and sometimes they're halfway around the world. It's more than extending the university's reach off the campus. It's about not just reaching outward, but bringing inward - bringing knowledge and wisdom into the university as well. It goes to USC's concept of being the university of the world. This is a center from which the entire world can benefit. We want to make sure we have the best environment for the students who are here, but that it is also available throughout the world, because the physical boundaries are going away." Once an instructor makes the decision to incorporate a technology into his or her curriculum and has learned how to use the tool, the next task is to modify the class schedule, presentations, assessments, and other materials to integrate the tool. This re-building process often takes as much time as did building the original class. Shepard is sympathetic but pragmatic about this part of the process. "Of course, it takes time. The integration process can be a substantial time sink. But look at it this way, picking a new textbook for a class takes a big chunk of time, too. You have to assemble the prospective textbooks, read them all and make notes, and research the books and authors for accuracy and to make sure they're current. The two are not really that different in terms of the time commitment." The commitment of investment dollars in multimedia kits and studio classrooms is also not inconsequential. Shepard acknowledges the financial aspect of the TEL initiative. "We're working to be the scholarly center of research and creativity on a worldwide scale, and we're extending the reach of the university. But there's also a financial component to it. After all, this is a business, and we can't pretend otherwise. So we have to be careful not to let the technology tail wag the dog. The investments we've made have to work financially, or they don't work at all." So what does work? Which tools truly engage students and enhance their learning, as opposed to simply giving them something different to read and absorb? Shepard is sanguine. "We always joke about the 'when it works' factor. The question of what works has less to do with the 'what' than with the 'how' - how we apply it. On some level it all works. I think there are technologies that can work extraordinarily well in a broad application, whether it's Blackboard or a videoconference. Then there are others that work in narrow applications, like a pure lecture, but might not be useful in a lab environment, for example. Shepard continues, "What doesn't work is when we use technology for the sake of using it. Sometimes faculty feel pushed in that direction - if they're not using these tools, then they're not doing their job. But there are still times when the best tool is a piece of chalk and a blackboard. My job is to help faculty know the difference." Shepard's advice to faculty who are still undecided is insightful. "In talking to students about what works, what strikes me is that, for them, it doesn't matter what tools are used. Blackboard, iTunes U, podcasts - to students it's all just a click. So I tell faculty to do the one or two things that work best for them. The students are fine with any of it. There's a certain amount of redundancy in all these tools, and faculty don't have to feel guilty because they're not doing everything." Steve Cunningham is a senior lecturer in technology in the Thornton School, Music Industry Department at USC. He can be reached atvoicetalent@mac.com.